Normally I don’t appreciate unauthorized use of nutmeg (or fennel seed, but that’s another story). Ever since Rachael Ray started touting her technique of grating fresh nutmeg into various sauces, it seems chefs are very hot to sneak it in where it does not always belong. 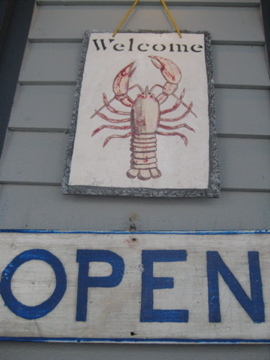 However, on a recent trip to Mabel’s Lobster Claw in Kennebunkport ME, I found nutmeg in a suprising yet welcome place: fried clams. I’m not much of a fried clam person, but MoSB (mom of SB) must have them each time she comes to town. And so, on our weekend trip to the coast, we visited Mabel’s, a tiny shack of a place littered with photos of famous clientele and decorated with gingham checked windows. 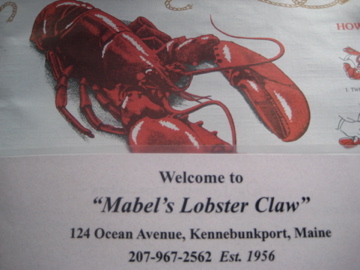 Mabel’s is the kind of neighborhood joint with placemats that teach you how to crack a lobster. There is a counter groaning under rows of homemade pies, and if you don’t order a slice before you leave you will loose all credibility with the wait staff. The fried clams arrive on a plate edged with faded brown filagree – the only other place you can still find these plates is in a dusty section of ebay. The clams are whole bellied, small, and sweet (which is how clams should be), but its the fry batter that sets them apart. Light in texture but still substantial, and with just a note of nutmeg at its finish. Normally my nutmeg annoyance would have forced me to declare blasphemy, but it was just enough to play on the sweetness of the clams. Lobster roll purists will not want to miss out on trying one at Mabel’s. It arrives in the ubiquitous split hotdog bun and the meat is clearly dayboat fresh (it is Maine…). If you like something else in your lobster roll- celery, onion- you won’t find it here. All you get is huge chunks of fresh meat that is indecently dressed- if heavy mayo is a winter coat, this lobster is wearing short shorts. 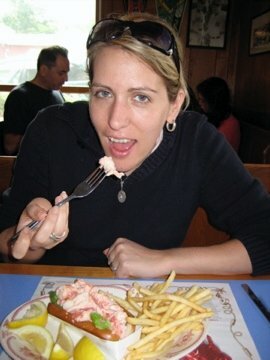 The fries on the side are thin and salty, and the portion is such that you can just squeeze in a few bites of shared pie. Wild Maine blueberry (teeny tiny berries that pop in your mouth) with a syrupy middle is your best bet, though the strawberry rhubarb is also popular. Mabel’s crust is a little dry for my taste, but if you order your pie warmed and with ice cream (as the waiters assume you will), you won’t even notice the crust. One word of caution: Do not order a margarita at Mabel’s. DoSB decided (in a rare whimsical moment) to order this drink at what is clearly a beer/diet coke kind of place. It took thirty minutes and two reminders for his cocktail to arrive, and when it did, he wished it hadn’t. Save your mixed drink leanings for The Ramp, just down the road in Cape Porpoise.